Create a budget position Choose one budget from the budget list. On the Edit tab in the Budget Positions group click New Position. Edit a budget position Choose one budget position from the budget positions list. On the Edit tab in the Budget Position group click Edit Position. Alternatively double-click on an item in the budget positions list. Delete a budget position Choose one budget position from the budget positions list. On the Edit tab in the Budget Position group click Delete Position. Change a budget position status Choose one budget position from the budget positions list. On the Edit tab in the Budget Position group click Position Status. On the drop-down list click the wanted status. Load budget positions as a template In the Templates group click Load Template. Save budget positions as a template In the Templates group click Save Template. 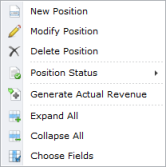 The context menu provides you with almost all basic features that are also on the InLoox PM Ribbon, such as New Position, Edit Position, Delete Position, Generate Actual Revenue, Expand and Collapse All. It has also such feature as Status, where you can define whether the budget is Not billed, Billed or Note billable. Right-click in the budget positions list to open the context menu. Work with the budget positions list - InLoox • Copyright 1999-2019 © InLoox GmbH. Tous droits réservés.